The Expanse Recap: Season 3, Episode 9, "Intransigence"
After last week’s fast-paced thrill ride of an episode, “Intransigence” pumped the breaks just a little, revealing a big secret about a mysterious new face—and reminding us that even characters we’ve come to know well can still surprise us. And, truly, The Expanse is dazzling at any speed. Of course, the Roci is very much in one piece and is in a weird, starless void zone with the torpedo in question not only hanging back, but somehow also changing trajectories. 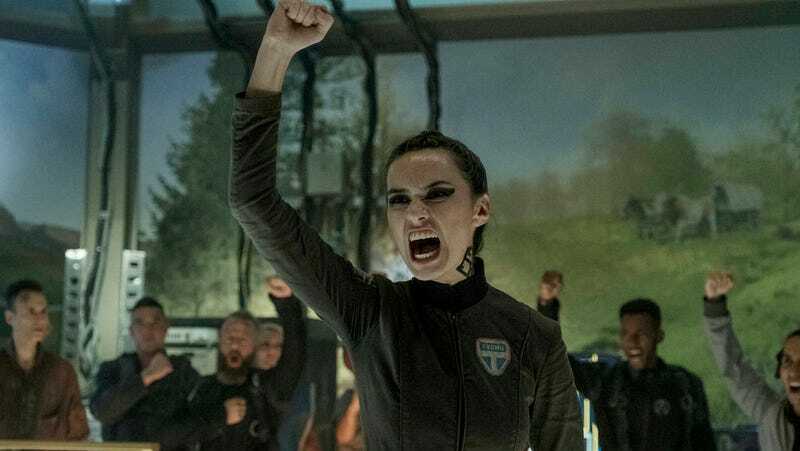 “Apparently, the rules ain’t the rules around here,” Alex mutters, which is The Expanse’s way of reminding us that while the show does take the “science” part of science fiction seriously, it’s also not afraid to have fun with the “fiction” part and bend logic when it needs to. The strange situation gives Holden, Amos, and Alex some insight into what they’re dealing with; the torpedo was going very fast, and when objects go very fast in the Ring, “something gets nervous and grabs ’em? That ain’t natural,” Alex says. “It reminds me of Eros,” Amos adds. Yikes. Amos has the best crazy eyes in space. Anyway, just then a probe pokes through the ring and back, and is swiftly followed by the MCRN ship Xuesen, whose crew of Martian marines will either try to fire on them (though torpedos, as we’ve seen, don’t work in the vacuum space) or board the ship and take control. Holden tries to make contact with Miller for more help, but the protomolecule-fueled specter fails to appear. Another Martian probe appears, but instead of going through the ring, it ventures to the edge of the bubble. “It’s gone,” Alex gasps. “It, like, um, blinked out of existence.” Holden and Alex decide that staying away from the edge would be most prudent for now. Amos is able to remove the chip that the cameraman planted, but without Naomi around to help, Alex admits he’s unable to undo all the fuckery it’s unleashed. Amos gonna Amos, so he threatens to kill the female filmmaker (who, it seems, genuinely didn’t know anything about the plan) unless her partner can fix the Roci. Then he comes up with a new strategy, which Alex endorses: outfit the pair with spacesuits and send them floating over to the Xuesen to explain that Holden’s being framed, since talking in person is currently the only way of communicating from ship to ship. They ain’t happy, but out they go. In a speech beamed aboard the UN Thomas Prince, Secretary-General Avasarala announces she’s recalling all civilian personnel, what with the attack on the UN ship and the Ring being all awake and manifesting its freakiness. Contractors—like our saboteur Melba—have the option to get paid even more to stick around, but dignitaries like Anna will be sent home. Anna’s disappointed, but the most important thing that happens in this scene is that the tinkling laugh of the ship’s resident socialite, Tilly Fagan, catches Melba’s ear. We then get a flashback to a fancy party where both women are in attendance... as are Julie and Jules-Pierre Mao. Melba (fake name, obviously; so far the show hasn’t revealed her real one) is Julie’s sister! And from the looks of it, Julie is her father’s favorite and Melba is very aware of that fact. Julie storms out of the mansion, but Melba tracks her down later at her favorite tree (a callback to season one). “Our father is a damaged man,” Julie tells her. “You’re never going to be good enough for him.” That’s some big motivation for Melba’s subsequent bad behavior, which has crystallized into a quest to destroy Holden, the man she blames for her father’s downfall. Back in the present day, Anna’s trying to figure out a way to stay on the mission, and Tilly—who’s got enough wealth and power to do whatever she wants—offers to help her. “You want to indulge in a selfish desire to be a part of something amazing,” Tilly guesses, not totally incorrectly. Later, Anna approaches Melba for a friendly chat, though Melba is standoffish, explaining that she’s just there for the hazard pay... not, of course, because she’s drowning in some major daddy issues. Aboard the Behemoth, the Belters are keeping a close eye on all the activity around the Ring. An MCRN broadcast comes over the wire, letting everyone know that they’re closing in on the Roci... so would everyone else please, pretty pretty please, back off? Ashford tracks down Naomi to give her the news that her friends are still alive, and to tell her that the Behemoth is going to pass through the Ring, Martian request be damned. Though Naomi doesn’t like Ashford, she hears him out when he tells her that he used to miss his old crew as much as she misses the Roci—until he realized that nostalgia was distorting his memories of what it was really like, making him only remember the good times. On the bridge, the ship prepares for its passage through the Ring. Drummer has her best captain moment yet, giving a hell of a speech to her nervous crew: “We. Are. Belters. Nothing in the void is foreign to us! The place we go is the place we belong... WE ARE THE BELT! THIS MOMENT BELONGS TO US!” Everyone is screaming and cheering (and, if you’re me, getting totally teary-eyed)—except for Naomi, who just looks on with an unreadable expression. After, she sneaks down to the skiffs to try and slip away, but Drummer’s waiting for her. “I came back for the wrong reasons,” Naomi admits. She will always be a Belter, but the OPA is not where she belongs anymore. Drummer is deeply disappointed—there’s some real affection and respect between these two—but she doesn’t seem totally surprised. And she lets her leave with a gentle warning: “Don’t go too fast out there.” Naomi heads to the Roci, but with no comms, they don’t answer her greeting. Never mind that. She’ll be home soon enough. Naomi, also deep in thought. And for one last “Whaaa?”, because that’s how The Expanse likes to leave us, Holden is preparing to surrender to the MCRN, thinking it’s the only option the Roci has left... when Miller shows up. “Where the hell have you been?” Holden thunders. “I got a case to solve and you want the truth,” the detective says, insisting that they head to the “crime scene.” That requires Holden to do a spacewalk, out in the cloudy void, where he then sets his sights on a blue sphere some distance away... and blasts off toward it. Was Ashford’s chat with Naomi really a pep talk, as it seemed at first, or a bit of reverse psychology intended to encourage her to go back to the Roci? With Naomi off the Behemoth, there’s one less strong personality around to keep him from stepping on Drummer’s authority. Anna’s fearful clergy buddy—and the UN soldier that’s accused of desertion—represent a very valid point of view: People who would JUST RATHER NOT go into the Ring, because venturing into the unknown is terrifying. These are characters that do not make for exciting scifi stories, but they are realistic, and it’s refreshing that they get at least a mention here before they flee back toward Earth.